Congratulations, you’ve decided to treat yourself to a wonderful new feature to accentuate your outdoor living space. All too often I have clients tell me they can’t decide which option is best for them. So I have to interject with some specific questions. How much do you want to spend? A custom built fireplace can easily add $10K to your budget. A newly constructed fire pit can run $2500 to $3500 depending on size and details. Keep in mind a fireplace is considered a structure and will require a permit. Actually both will require permits to run gas lines. Function of space. Fireplaces must meet city codes as a permanent structure. Typically that means a setback of 5 feet from a property line (or more). Some project sites just don’t allow for so much bulk or mass of a fireplace. Function of use. A fire pit is more of a casual conversation for a couple of individuals. Shapes don’t have to be round. Options include rectangles, triangles, hexagons, etc. Where as a fire place is a one sided elevation, nearly a wall with furniture grouped in front of a fireplace. Overall Theme. A fireplace becomes a major focal point. A fire pit is a less dominant feature. Options also include numerous choices of pre-fabricated, free-standing fire pits. Either with or without propane ranging in table top versions to simple wood burning fire rings set in the ground. At times, smaller spaces dictate having fewer permanent elements for greater flexibility. Fireplaces can be purchased as a kit, or even just the firebox itself. Then you may select a plethora of exterior finish materials such as stone facing or stucco. And of course there is the decision of wood burning or gas…endless possibilities. Even vent-less gas fire places can be used where no stack for smoke is required. So whatever your burning desires may lead you, Letz Design will gladly include either feature in your Master Plan. Contact me to get your new fireplace or firepit. 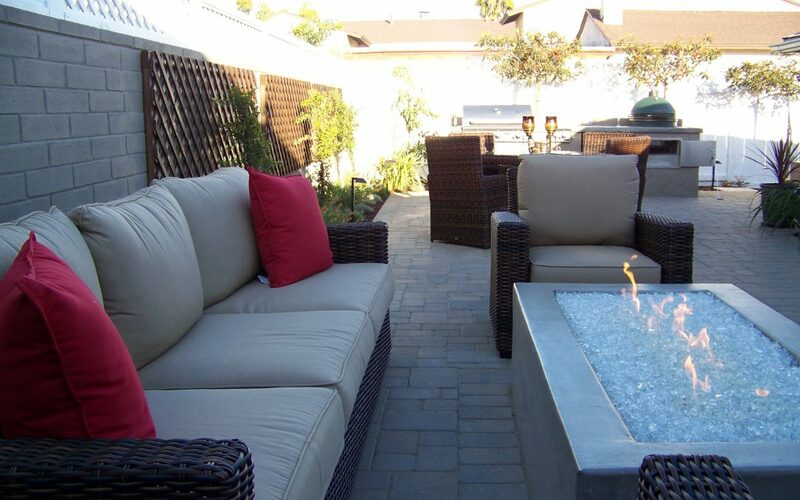 You are here: Home » Hardscape Elements » Outdoor Fireplace or Fire Pit?